Middle Farm is a peacefully situated traditional Dales farmhouse, with converted adjoining stable block for guest accommodation. It is noted for its excellent home cooking, and offers bed and breakfast with optional dinner and a warm welcome for visitors and their pets. 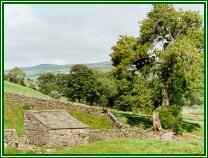 It lies next to an unclassified road linking Wensleydale and Wharfedale. The road used to be the main coach road from London to Richmond, referred to in Dodsley's road book of 1756. 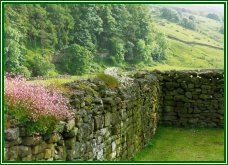 Coverdale is an ideal place for people and their pets to escape the 'madding crowd' and a good base for walking and touring any of the Dales' many beauty spots. There are 2 double rooms and one twin-bedded room - all with en-suite facilities. Guests have their own separate lounge and dining room and privacy is assured. Many thanks. 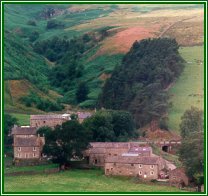 We have had 2 whole weeks of dreams Joy and Allan Wainwright, Derbyshire. Bed and Breakfast is £28 per person per night.There is a reduction for children under 12 and an additional reduction for children under 3 years of age. There is a surcharge of £5 per bedroom for 1 night stays. A 3 course meal plus coffee and mints costs £15. Special diets can be taken into consideration. Pets and children are welcome. There is ample off-road parking. Middle Farm is open all year round.